The Land Portal Foundation, Mokoro Ltd and Transparency International co-hosted an interactive webinar on sextortion in land governance and its implications on June 25th, 2018. The webinar featured an interactive discussion among expert panelists. Scroll below to read our interview with Annette Jaitner of Transparency International. She gives us insights into the matter and what sextortion means for land governance. 1) Why did Transparency International recently decide to run a webinar on the topic of sextortion? Why on the Land Portal? When talking about bribery and corruption, most of us tend to think about bribes in the form of money. But there is another currency of corruption, sexual favours. Sextortion refers specifically to the abuse of power to obtain a sexual benefit or advantage. Unfortunately, it is a problem that is taking rise around the world and which has sweeping costs in terms of physical and mental health, as well as human dignity. If we continue to ignore sextortion and refuse to talk about it as a currency of corruption, our picture of corruption will continue to be incomplete. Our responses will therefore not be sufficient or appropriate. As we all strive to be gender-responsive and to overcome gender-induced inequalities and injustices, we need to acknowledge sextortion as one form of gender based corruption, and we need to tackle it as such. This means that we, the anti-corruption and land governance communities, need to include it in our research on corruption, in our advocacy, in our outreach, and in our interventions and responses to corruption. In Transparency International’s work on land corruption, we very often engage with vulnerable communities. 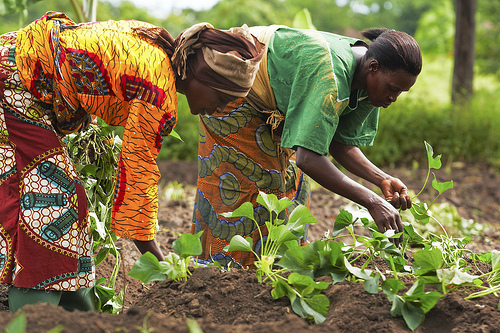 In vulnerable communities, both women and men are affected by land corruption, poverty and marginal social status. In addition to that, women are affected by discriminating social norms and sexual violence. Both men and women can be exposed to sextortion, but we hear predominately from women who experience it. Our webinar on sextortion in relation to land is meant to spark a discussion and generate insights. The Land Portal reaches many of the actors in the land community and therefore is the ideal platform for our discussions. The webinar was a first step, and we hope to keep the discussion going and hear much more about the experiences and ideas of others. 2) What do you feel the land rights community do to bring more attention to the issue? When we discuss sextortion, the reaction and perception is often still that women are “using their bodies to their advantage.” This clearly shows that there is still some work ahead, in terms of encouraging gender sensitivity and overcoming gender inequality. The other reaction that we often get is that land governance needs to be addressed before tackling corruption. The issue is that if we don’t counteract corruption, we cannot have good land governance, and the SDGs will not be reached. Corruption – which Transparency International defines as the abuse of entrusted power for private gain - undermines development and perpetuates poverty. It remains one of the major obstacles to good governance. The land rights community already does a lot to prevent land corruption, for example, by investigating land rights violations, fighting against land grabbing, campaigning for community land rights, demanding more transparency, providing information on land rights and legal advice, especially for women. If we, in the land rights community, want our efforts for good land governance to be inclusive and successful, we need to be aware that sextortion is a form of land corruption, and we need to take a common stance against it. Build its understanding of gender based corruption and sextortion and take a common stance against it. 3) Where can readers find more information about sextortion? There is some interesting material regarding sextortion. A good place to start could be a feature which Transparency International published in 2016 entitled Sextortion: Undermining Gender Inequality. Another interesting piece could be our publication on women, land and corruption and we have addressed the topic in relation to land in our gender guide. Finally, the International Association of Women Judges’ toolkit on stopping the abuse of power through sexual exploitation and sextortion, is a comprehensive resource which provides detailed guidance and information on the matter.